Selective catalytic reduction (SCR) is a process whereby nitrogen oxides are converted into diatomic nitrogen and water using a variety of catalysts. The process is found in the boilers, incinerators, and furnaces of power plants. 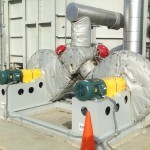 Industrial fans & blowers are used to produce induced draft air, forced draft air, and overfire air in these systems. AirPro builds industrial fans & blowers that maintain high-efficiency and consistent performance in the SCR process.